If you’re looking for a great used vehicle, you’ve probably already explored buying a certified pre-owned Volkswagen Passat. This vehicle is popular with drivers from Toms River, Brick, and Freehold, and with great safety features and amenities, it’s easy to see why. Our team at Toms River Volkswagen took the 2019 Volkswagen Passat for a test drive to see how it performs on the roads, and they have come back with a comprehensive look at all its features and performance stats. Read on for our certified pre-owned Volkswagen Passat review. Then contact us to schedule a test drive! There’s a lot of reasons to take a look at a certified pre-owned Volkswagen Passat. Besides getting to enjoy the diverse features and options of this impressive vehicle (which we’ve outlined below), you can drive securely knowing that your car has been subject to an in-depth inspection. This inspection covers every aspect and piece of your car, ensuring that your vehicle will provide you with a safe and enjoyable driving experience. You’ll enjoy routine maintenance checks and an impressive warranty, so ask about what certified pre-owned options are available at your local Volkswagen dealer today! The certified pre-owned Volkswagen Passat comes with a 2.0-liter engine that provides you with a sporty and zippy driving experience that’s a whole lot of fun—it gives you 174 horsepower and 184 lb-ft of torque, for power you can feel on any driving surface. The 6-speed automatic transmission gives you intense power and control no matter what the driving conditions may be. It comes with Tiptronic® and Sport mode, ensuring your car is ready to handle any situation. You can seamlessly shift between gears with ease, for a smooth and comfortable driving experience. 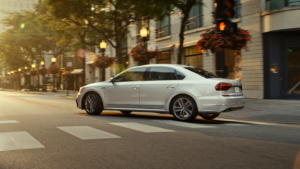 The certified pre-owned Volkswagen Passat comes with a host of customizable features that will have your car turning heads on the road, no matter where you go! There are seven colors to choose from, giving you the variety you need to make your vehicle as unique as you are! You can stick with iconic classic shades like black and white, or explore something edgier and modern like the metallic brown and blue options. Available LED headlights with Daytime Running Lights are another great amenity offered by the VW Passat. Not only do they add a sharp and fashionable edge to your car, but they even provide ample visibility on even the darkest of evenings. And with keyless access, getting on the road quickly is easier than ever. All you’ll need is your key fob handy—like in your purse or pocket—and you’ll be able to jump in your vehicle and head out without having to wonder where your keys have gone! Now that you’ve read up on our certified pre-owned Volkswagen Passat review, why not try it out for yourself? Head on over to Toms River Volkswagen today to explore our vast inventory of certified pre-owned vehicles, speak with our friendly and enthusiastic staff, and schedule a test drive in the vehicle of your choice. Whether you’re exploring Toms River, Brick, or Freehold, we’re sure to have the car that’s right for you, so visit our certified pre-owned Volkswagen dealer near you today!